Thank you very much for this beautiful website. Excellent spot for a soviet photo gear collector. Would be nice if you could also cover camera accessories like flashes, lightmeters, rangefinders. But anyway, good job really, keep it up. Will definitely contact you if I find something rare here in Baku. Thanks very much for putting this informative site up. I am seriously pondering getting myself a Russian Classic and there are so many to choose from it's hard to know where to start: Especially as without reading a site like yours, a buyer can't know if the camera and lens combo are standard issue or put together by the seller. You have cleared up a query I had simply by having the info available: So thanks again. I will repost when I have bought my camera Cheers Tj. Great informative site. Thank you. Just wanted to say - great page! Dear Admin, many thanks for these special sites. Today I bought a Zorki 4 special edition. 50 years of Soviet authority. After I get in touch with your site I have a good feelig to buy. Your No PM 1825. Thanks very much. The Fotokor-1 are built for a very robust usage. It's true,that they are not totally at the state of the best german cameras. Indeed - my two Fotokors were more or less working, when I got them, while they were in a very sad looking outer state. 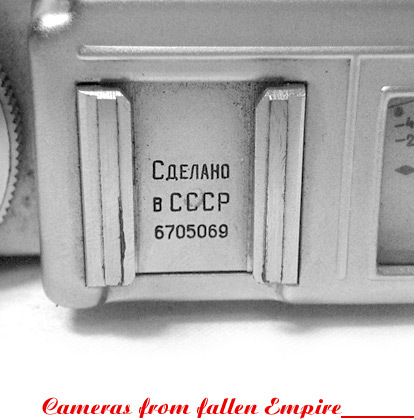 I've seen famous german cameras, which were in a much better looking state - but with totally stuck mechanics. But the bellows of the Fotokor is of a pretty formidable hardiness. One of them was grey, white and totally moldy, really a health risk in that state. I thought of throwing him away, but gave him a chance. At first I washed the leather side intensively under the water tap, dried him, washed the inner side somewhat less aggressive, dried it - it was still smelling moldy. After appending 30% vinegar and drying this smell was gone, and then I used a lot of leather care. The bellows is surviving, he's black without further coloring, is in a very good fashion, and has obviously no light leak. Believe it or not - I was also not believing such a success before this crazy procedure. I wouldn't dare to append 5% of such a procedure on another bellows. I've seen some bellows, for which I had to use even leather oil with ultralarge care just to avoid further damage. Im owning two Fotokor-1, a PK0245(9150** with Ortagoz 9667**) and a PK0235(6640** with Ortagoz 6744**). The stops on both were bad, so I wanted to repare them and had less success: Some blades were broken, and one shutterblade of the 245 also - the very unusual material for them is celluloid - like non safety films - tending to be brittle and to selfignition increasingly with the years. Burning match - parts are immediately burned down. Too, the GOMZ shutter housing / lens mounts are internally very different for the two lenses (looks like war restrictions for the 245) - housings are very different to open. The 6744** with 4 housing threads, the 9667** 3). You should store the Fotokor at 30°C or lower, avoid it to put them in a fire dangerous area! nice ! body marked B CCCP no 6023537.Shutter blocked/out of order probably for having change time before rotating the shutter knob. What can I do? Someone can give me a simple instruction (not technical) to adjust it ? Thanks so much. Very nice webpage! I have got a Vilia Auto from my mom. She bought it in Moscow in 1980. After some repairs, it is still in perfect shape. I love it! I love the soviet cams! I have a Zenit 212K. Nice website!